We received slightly over 4500 entries. We have now responded to approximately 2220 entries that unfortunately were not for our list. This leaves us with roughly entries. Of those, about 543 are to be considered further, and just under 1800 still need to be read. So we are almost halfway through. So, if you haven’t heard yet, sit tight. You’re still in the running! Many thanks to Harper Voyager for being so good about keeping anxious authors updated. If you received a rejection from Harper Voyager, or didn’t make the deadline back in October 2012, you may want to consider submitting your manuscript to Random House. The publisher recently launched three new digital imprints and is seeking unsolicited manuscripts. This is a great opportunity to be published by a major publishing house. You can find more information here. Is your manuscript not quite ready yet? Need a little advice to help polish your prose? I found a few free-for-now writing guides that look interesting and informative. One is a humorous essay written by a New York Times bestselling author and published for free by HarperCollins. For a few “glorious” weeks, Jason Mulgrew’s first book, Everything Is Wrong with Me, appeared on the New York Times bestseller list, before dropping off and returning to the deep obscurity to which it belongs. Jason Mulgrew has not been able to shut up about it since and now believes that he is qualified to write the following primer, “How to Write a New York Times Bestseller in Ten Easy Steps.” Please accept our apologies in advance. 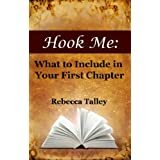 Writing a book can be daunting, especially when it comes to writing the first chapter. Improve your writing skills and learn to write the best first chapter possible with these writing tips. A checklist and a first chapter analysis are included in this easy-to-understand, concise guide on writing fiction. Most writers experience a block at one time or another. It may manifest as procrastination,lack of inspiration or any number of personal issues. The good news is, there are easy solutions to get you writing again, including the use of Images; Oracles; Brain-Hacks. Whether you write fiction or non-fiction, are a budding novelist or a freelance magazine writer, you’re guaranteed to find at least one technique to vanquish writer’s block forever! This entry was posted in Kindle Bargains and Freebies, Writing and tagged Books, Free, Harper Voyager, Kindle, Random House, Writing by Lori Saltis. Bookmark the permalink.